Lightweight exercise sheet with a mesh lining which is perfect for use in warmer weather or on unclipped horses. 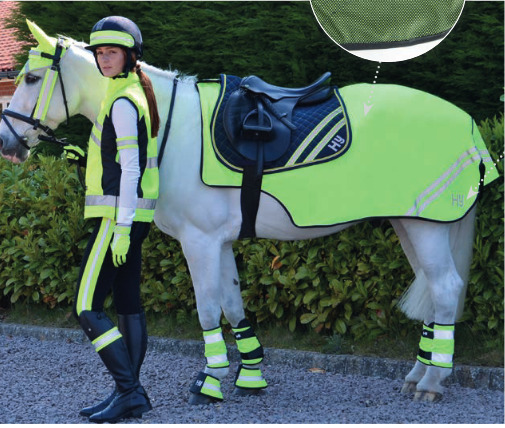 Designed to offer maximum visibility, it features reflective piping around the edges and a double reflective strip on both sides that also appears across the tail flap. Shaped around the saddle to leave clearance for the rider’s legs, the exercise sheet is secured with touch tape fastenings to the front of the saddle and a fillet string. There are currently no questions for HyVIZ Reflector Mesh Exercise Sheet - be the first to ask one!